“Ready Steady NihonGo!” is another wonderful Japanese-learning/teaching resource by the Japan Society. The website provides ten 45-minute lesson plans for introducing children to the Japanese language and culture. The lessons are fun and interactive… it makes me want to be a Japanese Teacher! Each lesson includes printable flashcards and sample dialogue. subject areas are also listed, thus making Ready Steady NihonGO! a complete and relevant unit of work in any upper primary classroom. the ten week course can be expected to show progress up the rungs. and these will support any future study of Japanese. If you are a parent teaching your children Japanese or a Japanese Teacher looking for a wonderful resource, please check out Ready Steady NihonGo! You’ll be glad you did! Dorilu.net is a website where you can customize and print various drills for learning in Japanese (all free!) . There are drills for math, Japanese language (mostly kanji practice), geography, and English. You can even search for drills by grade level (1st~6th grade). Looking at these drills makes me nervous for my daughter to enter elementary school. Some of these worksheets are very difficult! Oh.My.Goodness! This is one of the BEST hiragana-learning websites for children I have ever seen!!! This hiragana-learning website, Aiuebu/あいうえぶ (by S5-Style) has been designed for children ages 3 and up. The purpose of the site is to provide children with a fun and cute way to practice reading and writing their hiragana. I have to say… it sure is cute! I think it would only be better if it would pronounce each kana and word for you when you click on it. It looks like they are adding more words daily. Don’t forget this Friday, February 3rd is a Japanese holiday called Setsubun. 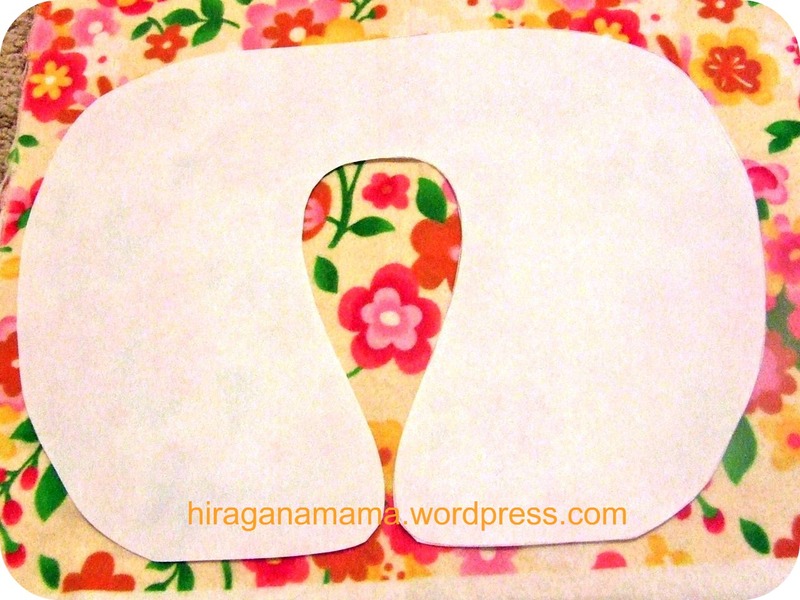 I posted about Setsubun last year HERE and HERE (click to see lots of fun activities and printables!). It is a great way to chase out evil and invite happiness into your home for 2012! (If you are eating eho-maki, the direction to face this year is north-north-west). New for this year: Enjoytokyo.jp has cute printable oni masks HERE. I especially like this disco-oni! Who usually ends up playing the part of “oni” in your family? In ours, we all take turns. And instead of throwing beans, we throw mini marshmallows… less chance of someone getting hurt! But she also has these super-cute printable kokeshi calendars for 2012. I thought some of you might like her work as much as I do! Thank you, CreativeMamma! We bought plane tickets to Japan! Yipee! I am EXCITED but mixed in with the excitement is a lot of nervousness. I am especially nervous about how my kids will do on an airplane for 15 hours. We don’t plan to take car seats and I know their little heads will not reach the headrests on the airplane’s seats. 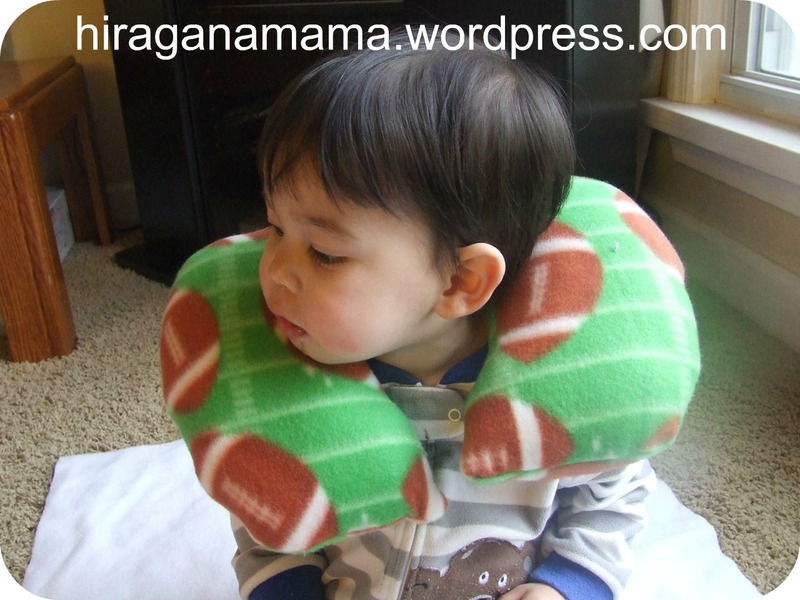 SO… I decided to make them their own travel pillows (they might be called “neck pillows” too). They turned out even better than I had expected, was inexpensive, and they each took less than an hour to make, even for a beginner sewer like me. Want to make some too? Cut on the solid line for 4T (and up) and the dotted line for about 2T (my son is 18 months and this size fits him perfectly). Lay the pattern onto fabric (I recommend fleece). 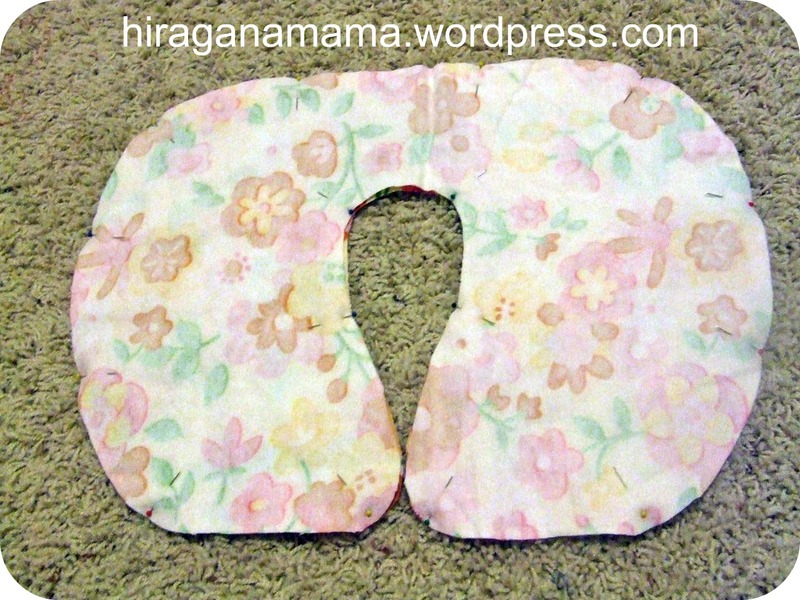 Make sure the fabric is folded in two so you get two identical pieces. 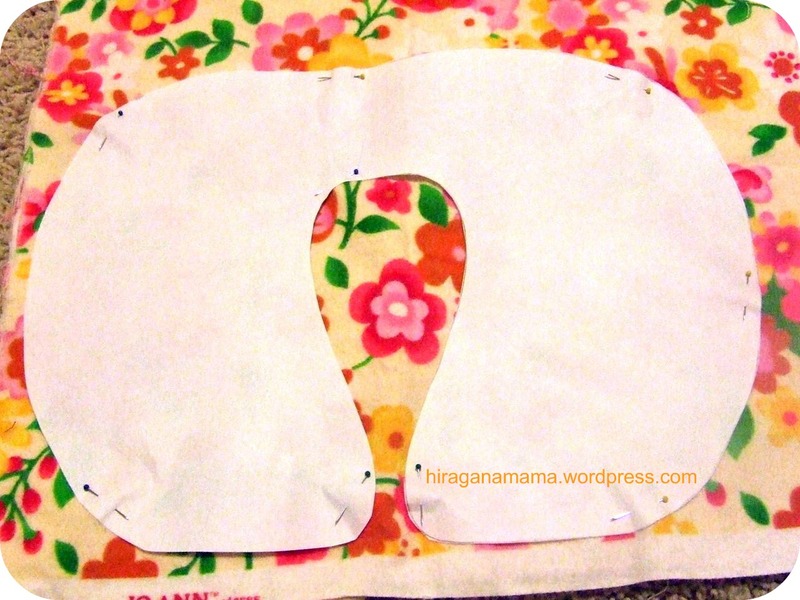 Next, pin the pattern into place. 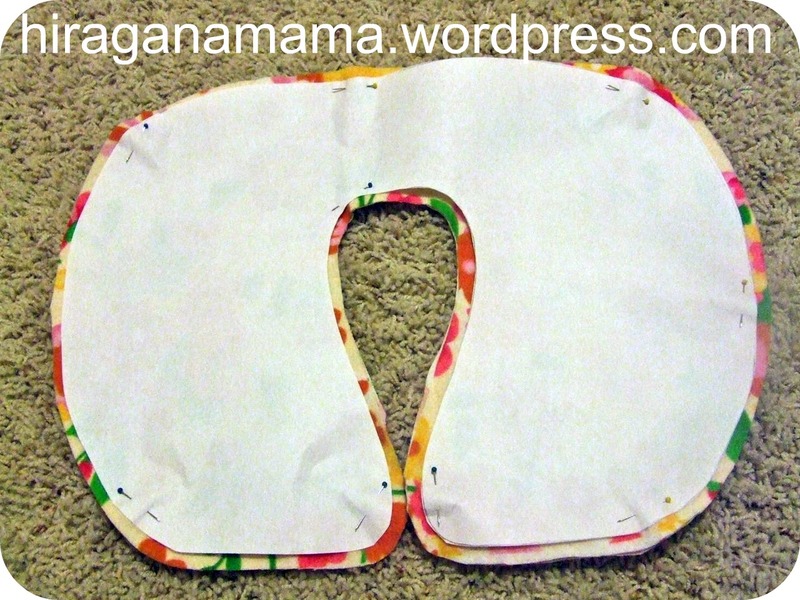 Next, take the pattern off, and turn the fabric so the right sides are facing each other, and pin. 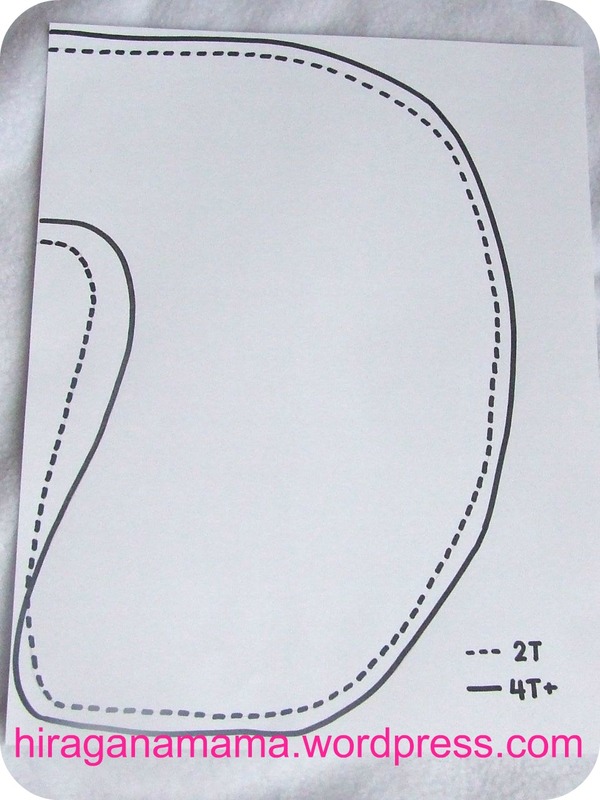 Then sew all around the edges, making sure to leave 1/4″ seam allowance (is that what it’s called?). IMPORTANT: Leave about a 4″ opening UNSEWN so there’s a hole to put fiberfill in! 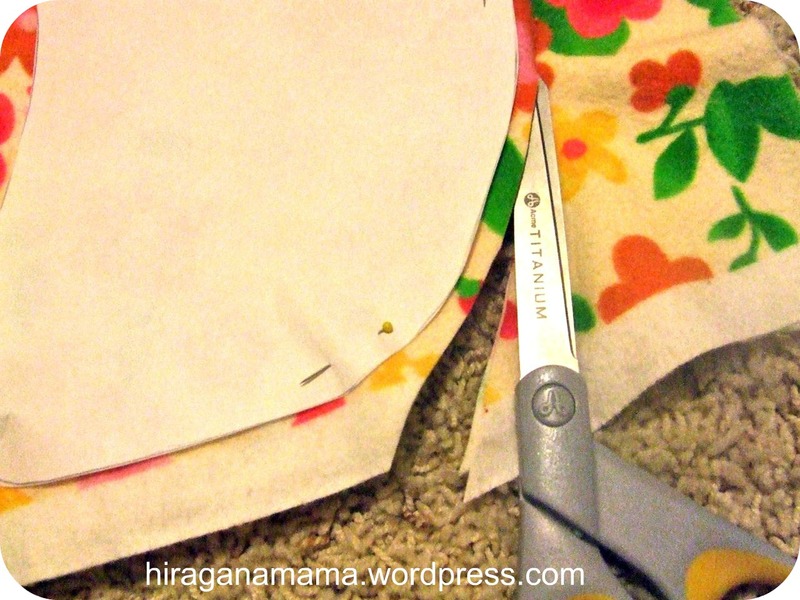 Another tip: Sew slowly and carefully around the corners. 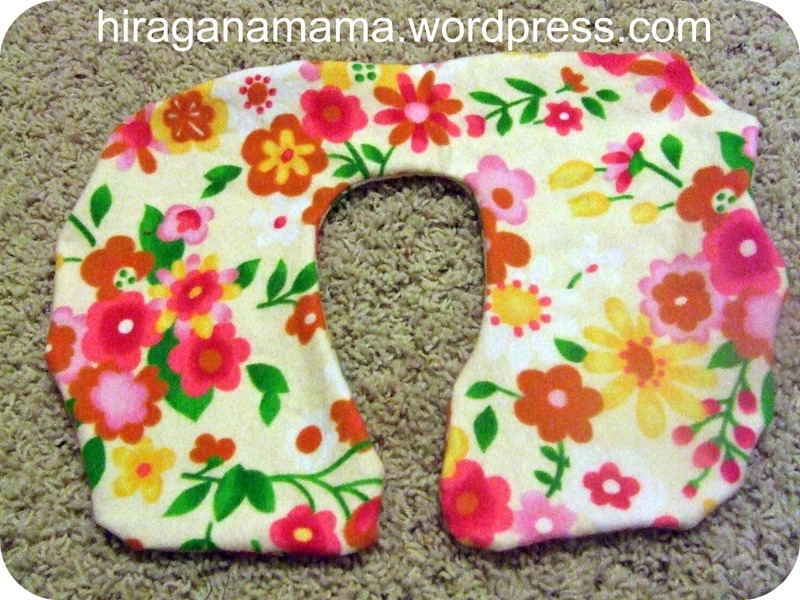 When finished, turn the pillow inside-out. 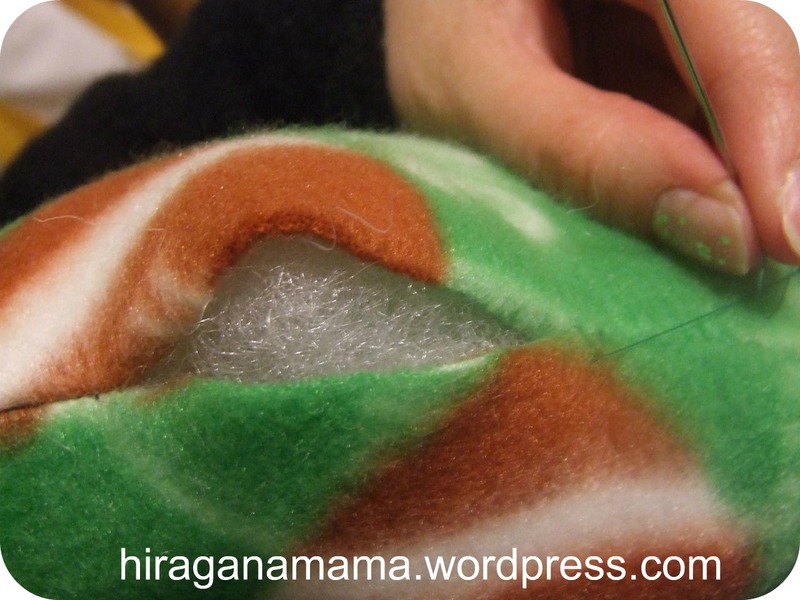 Then, fill the inside of the pillow with fiberfill (the stuff you put in pillows or stuffed animals). I bought mine at JoAnns… they were located in the pillows section. Stuff it a lot for a firm pillow and less for a soft pillow. 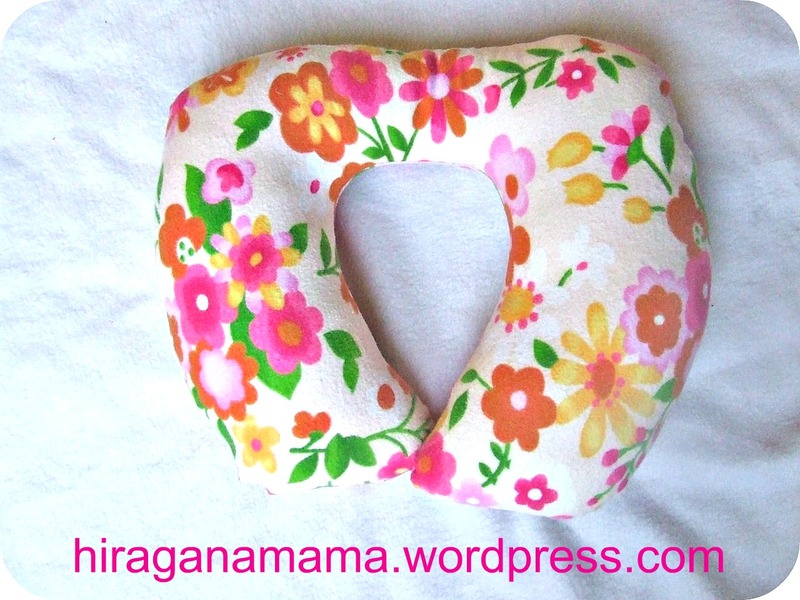 I prefer firmer for these travel pillows. 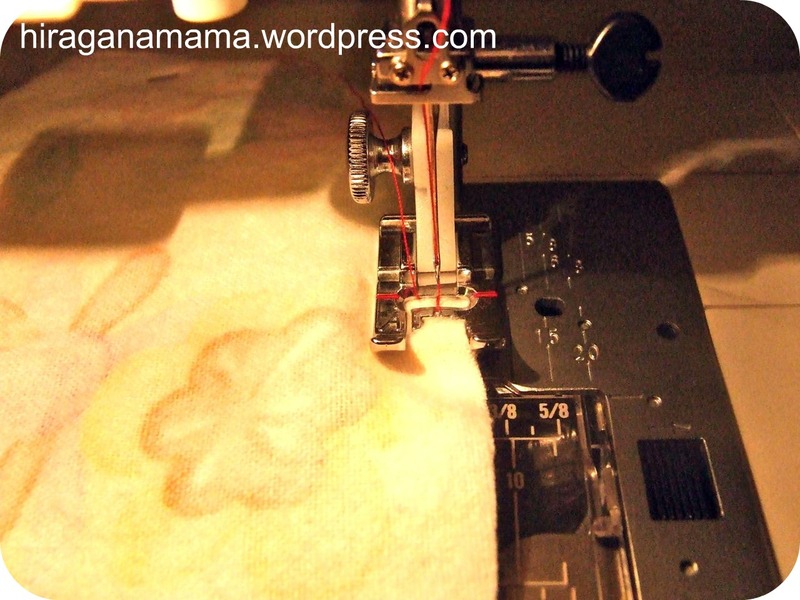 When finished stuffing, sew the opening closed by hand using a blind stitch. And voila! 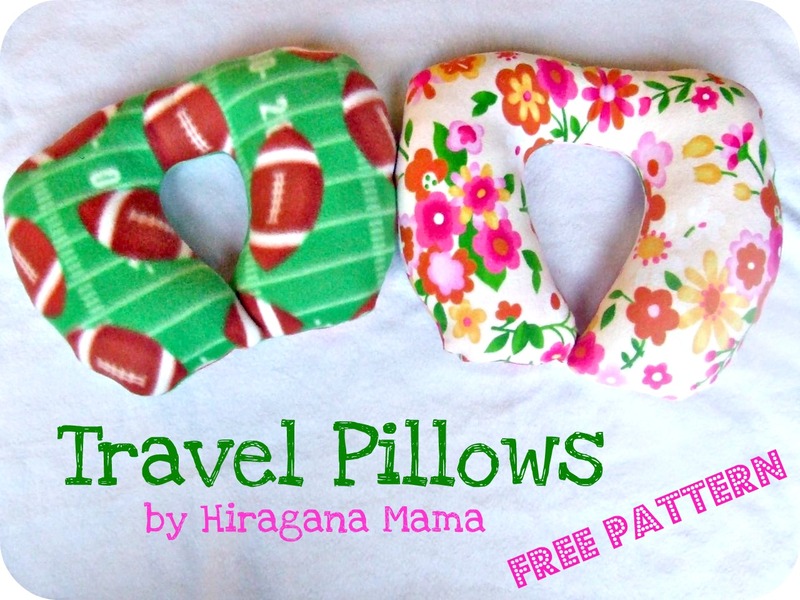 Custom travel pillows for your kiddies! Isn’t this football fleece too cute? It was 70% off so I paid less than 2 dollars for it! 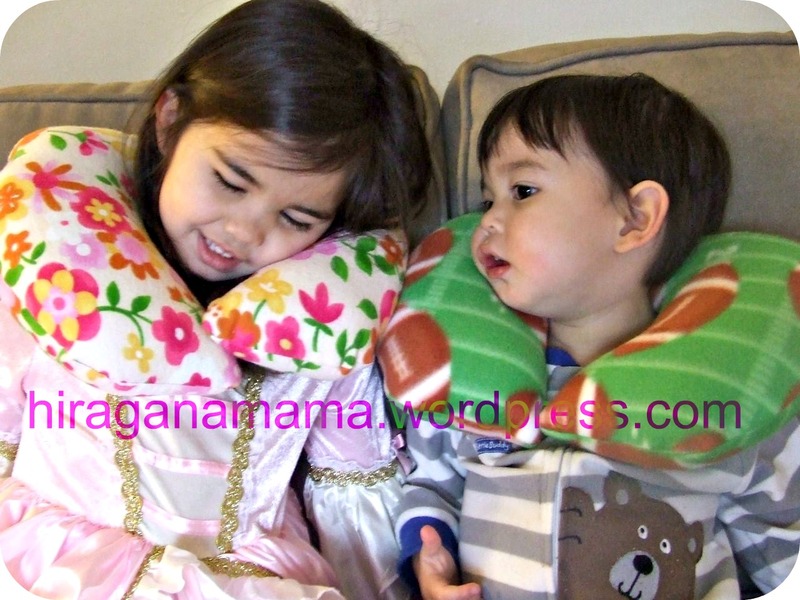 Both of my kids LOVE their travel pillows!! I just hope the pillows help them sleep comfortably on the airplane! How do you help your children fall asleep and sleep comfortably on long flights? P.S. Even though I sized my daughter’s pillow to “4T”, I can use it comfortably as well. So go ahead and make one for yourself too! I found a great Japanese website called “KC Lab Hands-On Project“, which is a part of “Kids Creative Lab.” The mission of this site is for children and parents to have fun playing and learning together. There are printable activities for all age levels from pre-K through high school. These activities include mazes, hiragana practice, math, stories, etc.